This will load a page where you can upload your MP4 file. First, customize your transcript by choosing the timecode insertion interval, start/end positions and speaker identification. 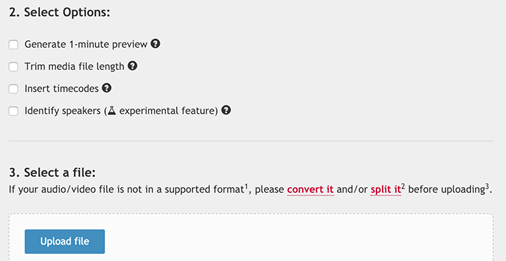 Once you're ready, click on the "Upload File" button to select the MP4 file that you want to upload for convertion. Click on "Choose audio/video" to select the MP4 file again (due to privacy reasons we don't store your MP4 file on our servers). The MPEG-4 video file format is the most common video file format used today. It achieves a high degree of compression (hence smaller file sizes) without compromising too much on the video quality. It can also store audio, subtitles and still images.